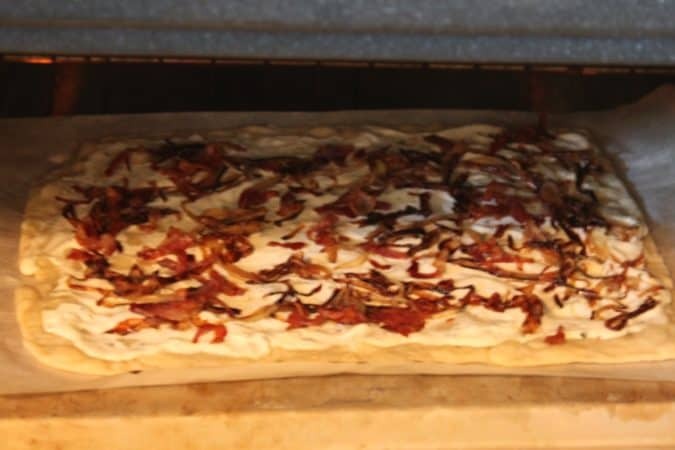 Instead of regular thin crust pizza make this German Pizza called Flammkuchen! This is one of my favorite dishes in the summertime in Germany, especially when paired with a Radler (German beer mixed with Sprite) sitting outside soaking up the sun! 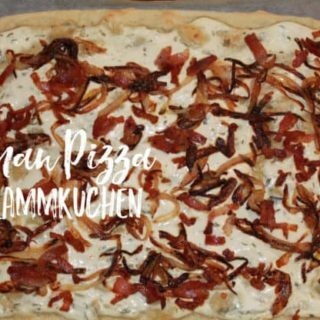 Flammkuchen is a German thin crust pizza with crispy bacon and onions with a sour cream/greek yogurt sauce. The sauce they use in Germany is Schmand, but we don’t have that in the United States. 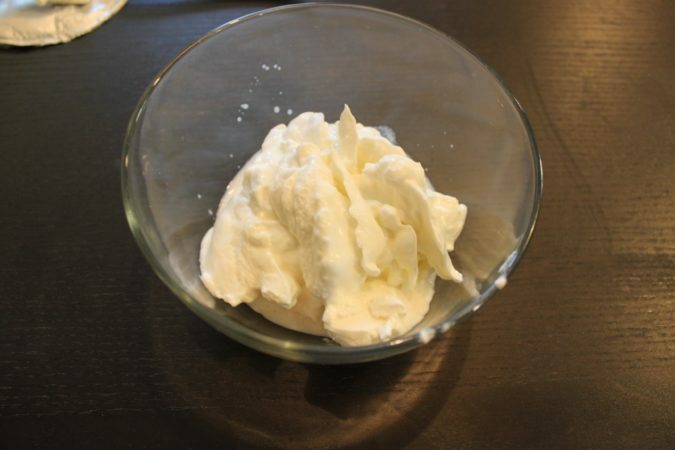 I used a mix of Greek Yogurt mixed with heavy cream, but you could use sour cream mixed with heavy cream as well. Place it on an upside down sheet pan and bake! 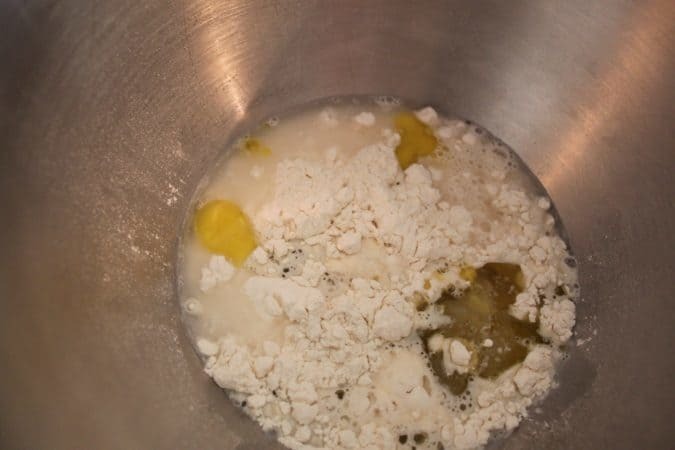 In the bowl of a stand mixer with the dough hook attachment, Mix together the flour, salt, water, and oil. 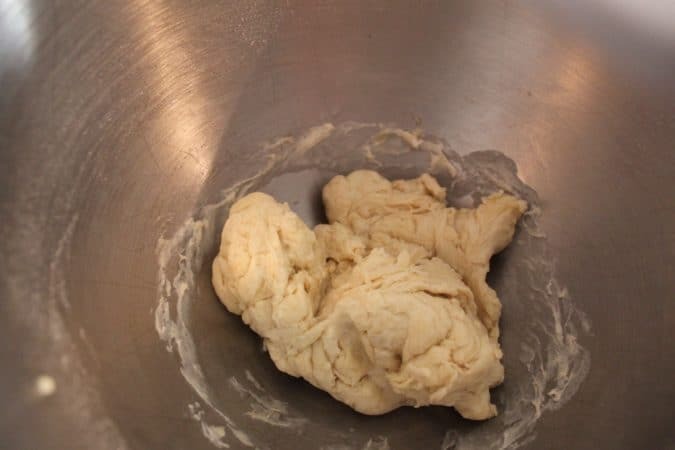 Knead until smooth and well combined. 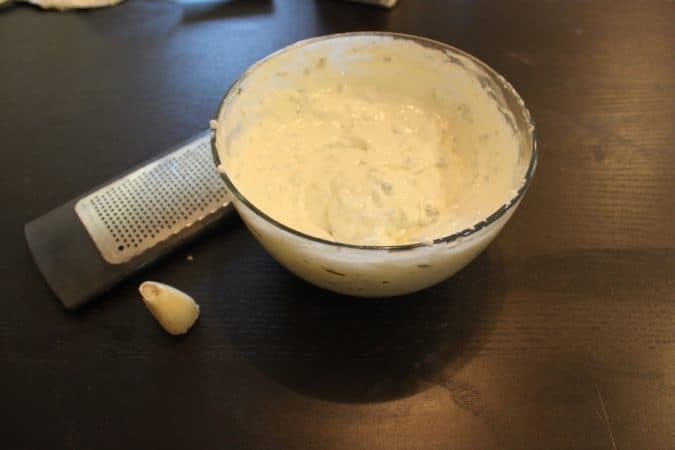 Grate half a clove of garlic on the microplane into the Greek yogurt mixture, mix well. Mix in green onions into the mix. Reserve. 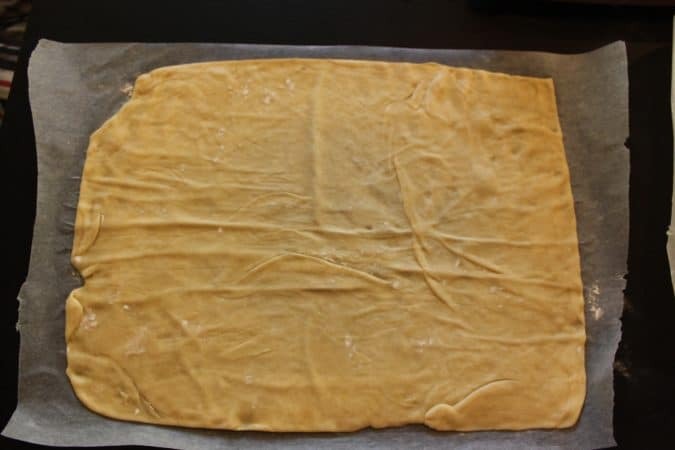 Roll out the dough on a large piece of parchment paper until very thin. 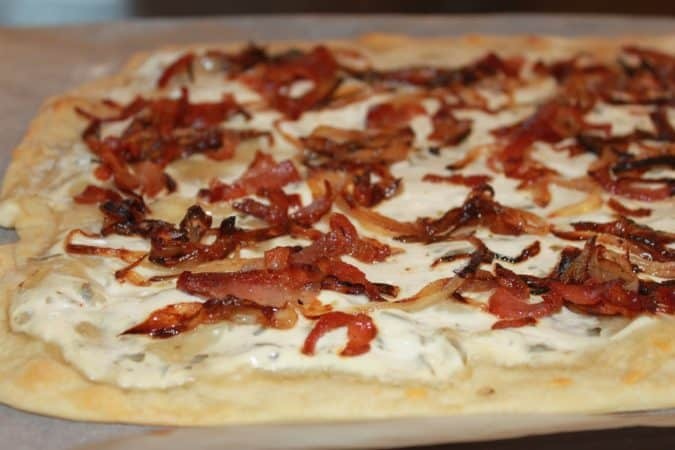 Place the parchment paper and the dough onto an upside down sheet pan. 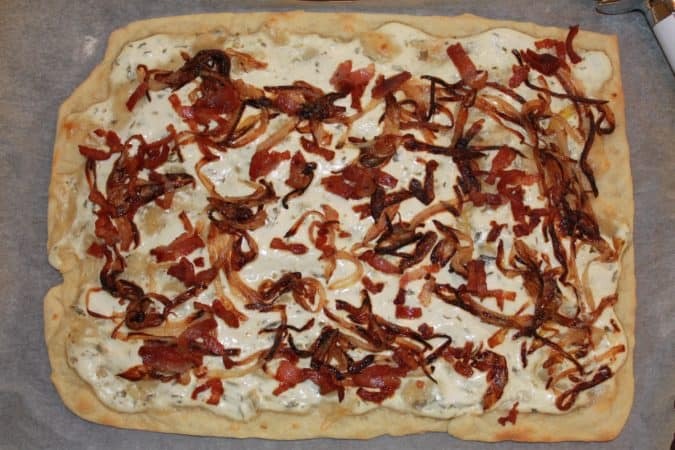 Smear a thin layer of the Greek yogurt and heavy cream mix onto the dough. Sprinkle evenly the onions and bacon. 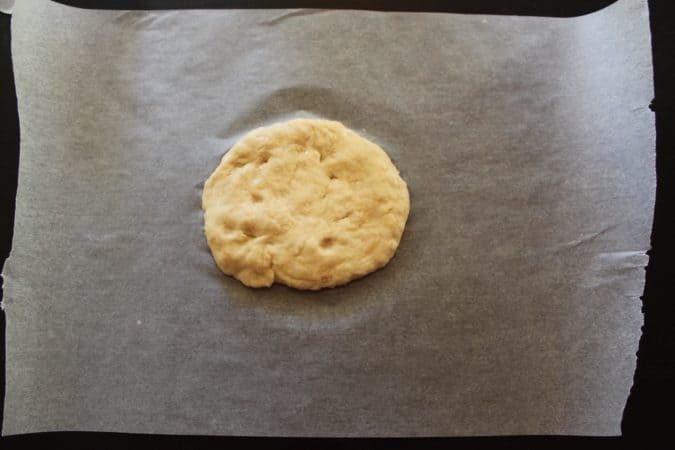 Bake for 15-20 minutes depending on your oven, until the dough is crisp. I will be definitely making this again! The crust and toppings were soo good! This is something I have actually craved over the years. Wish we could buy the German speck here, so much better. How much Heavy Cream do you use with the Greek Yoghurt? Do you whip the cream? This is my first time on your blog. I will be back. Where were you in Germany? We were in Lahr, Schwarzwald. Thank you so much for visiting my blog. I use just enough heavy cream (unwhipped) to slightly thin out the Greek yogurt so it can spread out on the dough easier. 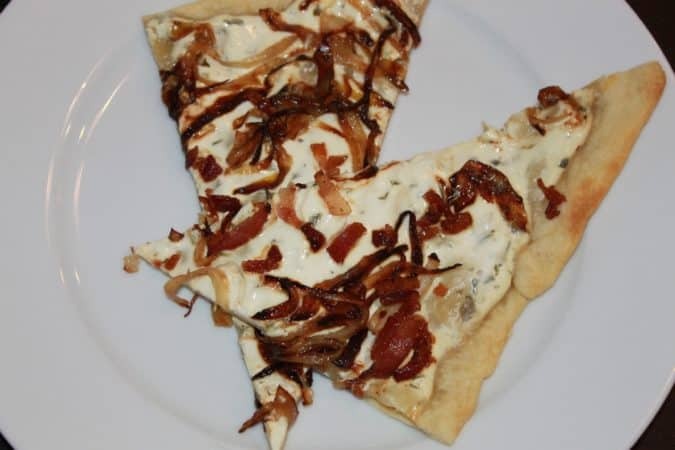 You can use creme fraiche too, but this is a little more budget friendly. I lived over in Ludwigshafen for a little over a year and completed an internship in Sinzig, Germany. My husband’s family and friends live near Bonn.